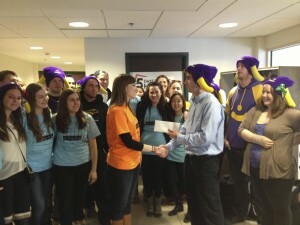 5 days for the Homeless reps receive a $500-cheque from the Water Buffalos. (Photo by Justin Smirlies). To increase their donation count after the campaign was completed, the 5 Days for the Homeless team at Wilfrid Laurier University decided to host a barbecue on Ezra Avenue on St. Patrick’s Day, where nearly 6,000 students were out celebrating the annual event. However, around $600 of their proceeds — which were held in a donation box at their booth on Ezra — was stolen. “We had the cash box out there right there in front of me, and it just got stolen. I realized it a second too late and couldn’t grab the guy. [It] had at least $600 in there,” explained Laiya Carayannopoulos, the campaign director for 5 Days. Carayannopoulos noted that news of this theft had spread shortly after it occurred. “A lot of people have been talking about it, a lot of people know about through word of mouth and it has spread. A lot of people are really upset about it — so outraged by it,” she explained. As a result of the theft, the Loyal Order of the Waterbuffalos — a campus club that hosts social gatherings for various charities — donated $500 in compensation. The Waterbuffs, as they are called, hosted an event on St. Patrick’s Day that generated donations, and they decided to share some of their proceeds. “We have this money and we look for opportunities like this where we can give back to the Laurier students who are involved,” he added. In total, the 5 Days campaign raised approximately $10,000 for Reaching Our Outdoor Friends (ROOF) and Argus Residence, two youth shelters in the Kitchener-Waterloo area. Carayannopulos noted that the figure last year was similar. She added that she hopes that the support she saw on campus during the campaign continues and that students lend a helping hand to those in need. “I really want people to carry that forward and to understand the stigma surrounding homelessness isn’t correct a lot of the time. If you were willing to show that kindness to someone on your campus, the next time you [see] someone out in the cold, just reach out,” she said.